Tags: Antique Map, Asia, China, Japa. Antique Map Chinese Empire by Bonne titled ‘Carte de l’Empire de la Chine ~ De la Tartarie Chinoise, et du Royaume de Corèe: avec les Isles du Japon’. 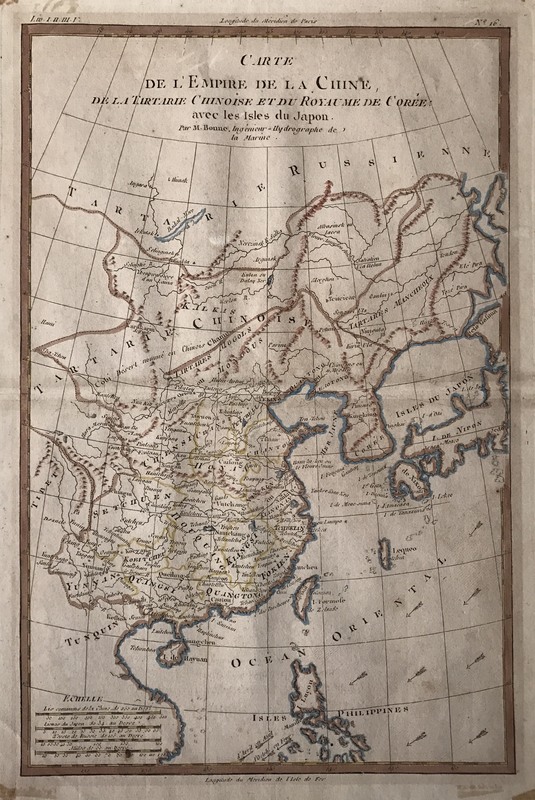 Rare map of showing China with Corea, Japan and partly the Phillippines, published in 1750 by Rigobert Bonne, in Paris. Rigobert Bonne (1727–1795) was one of the most important cartographers of the late 18th century. In 1773 Bonne succeeded Jacques Nicolas Bellin as Royal Cartographer to France in the office of the Hydrographer at the Depôt de la Marine. Working in his official capacity, Bonne compiled some of the most detailed and accurate maps of the period. Bonne’s work represents an important step in the evolution of the cartographic ideology away from the decorative work of the 17th and early 18th century towards a more detail oriented and practical aesthetic. With regard to the rendering of terrain Bonne maps bear many stylistic similarities to those of his predecessor, Bellin. However, Bonne maps generally abandon such common 18th century decorative features such as hand coloring, elaborate decorative cartouches, and compass roses. While mostly focusing on coastal regions, the work of Bonne is highly regarded for its detail, historical importance, and overall aesthetic appeal. Dimensions: 325 x 210 mm.